When it comes to marinas Bluffers Park Marina is a one of the best kept secrets in Toronto and we want boaters and sailors to know about it. That’s why we’ve put together the ‘Free-Night Stay at Bluffers Park Marina’ offer. It gives boaters and sailors the opportunity to moor their vessel overnight in one of our slips for no charge so they can spend a couple days having a fun, family boating or sailing weekend while experiencing the atmosphere, amenities and multi-national community that makes Bluffers Park Marina such a unique and special place. 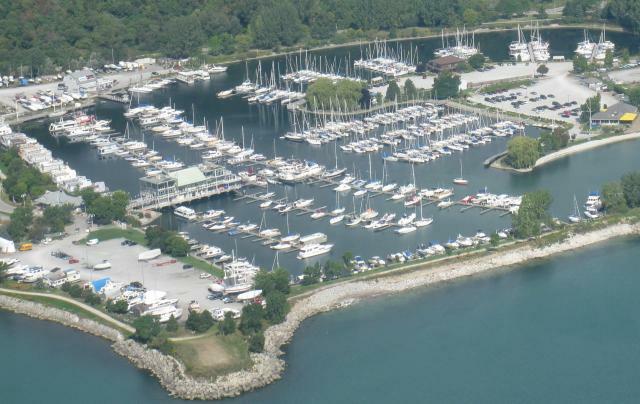 You’ll need two days to discover all that Bluffers Park Marina has to offer. Feeling hungry after being out sailing or boating? The marina boasts three eating establishments on the menu–all family-friendly. Enjoy a formal meal at the fully-licensed Bluffer’s Restaurant. Prefer a pint and more casual grub? The Dogfish Pub will fit the bill. And if it’s a quick bite you crave there’s a snack bar that serves up burgers, dogs, fries and cold drinks. Want to do your own cooking? Bluffers Park Marina can accommodate that too with two, covered party docks that come with a barbecue and propane. Afterwards enjoy some family fun exploring as Bluffers Park Marina is nestled among 240 acres of parkland. Take in our award-winning gardens then stretch your legs on the 3.1 kilometer Bluffers Park Trail which features a spectacular view of the Scarborough Bluffs and plenty of bird species to spot along the way. No weekend would be complete without hitting Bluffers Park Beach. It’s wide and sandy which makes it ideal for Frisbee or volleyball. The water is wonderful too–Bluffers Park Beach is one of eight swimming areas in Toronto that has earned a Blue Flag swimming designation—so go for a swim or rent a paddle board. You’ll have so much fun at the beach you might forget you came to Bluffers Park Marina to do a little boating or sailing too! Another great thing about Bluffers Park Marina is it’s Toronto’s only full service marina. Our on-site facilities include fuel and complete boat yard services. If your boat requires repairs, no problem. We carry an extensive range of in-stock Mercruiser, Yanmar, Volvo Penta, Westerbeke and Perkins boat parts on site and our certified mechanics provide both on land and in-water boat repair. No other marina in Toronto offers this level of peace of mind. See what you’ve been missing. Enjoy a fun, family weekend of boating or sailing. Book your free-night stay at Bluffers Park Marina today by contacting our office at admin@bluffersparkmarina.ca or 416-266-4556 any time between 8:00 A.M. to 8:00 P.M. seven days a week.